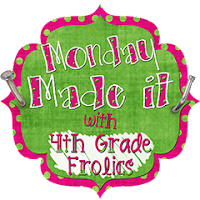 After a flurry of vacation and setting up my classroom, I had time this weekend for another Monday Made It. I downloaded a free "Welcome Back!" banner from The Bubbly Blonde's TPT store. I only printed out "Welcome" since it will be the students' first time in my school, and I didn't want to waste paper. Since the the black and white theme really didn't go with my bright colors theme, I used my beloved circle cutter to cut out the circle containing the letter in the middle. Then I cut out pennants from my theme scrapbook paper. To do this easily, I cut from the top corner to the bottom middle. I did the same thing from the other top corner, leaving me with a pennant shape. I glued the letter to the pennant. Then, of course, I laminated it. I strung a thick string across my wall, using Command hooks at either end. I used corresponding Mod Podged clothespins to clip the pennants to the line. I plan to keep the line up all year and use it to display students work, holiday banners, or other fun things. What a brightly colored welcome sign! I love that you used clothes pins to hang it off of the string! I'm liking those clothes pins! I might have to re-evaluate my idea for my pennant banner.